Click here for Part Two of the interview. KS -Would you explain your interpretation of Loki’s character and meaning? EE - I really love Loki, despite his faults. He’s a really, really clever guy who can sometimes act impulsively and sometimes be cold and calculating, but he’s always simply trying to amuse himself. He’s a sociopath, narcissist and “social engineer.” He’s used to being the smartest guy in the room, and it bores him. I also love that people connect him with fire. I know it comes from a false cognate with Loge, but he is very much like fire – lots of capacity for warmth, lots of capacity for destruction, and it must be tamed and kept in check at all times or it will consume and destroy you. KS - You write that Loki “loved to stir up trouble, to keep himself entertained. 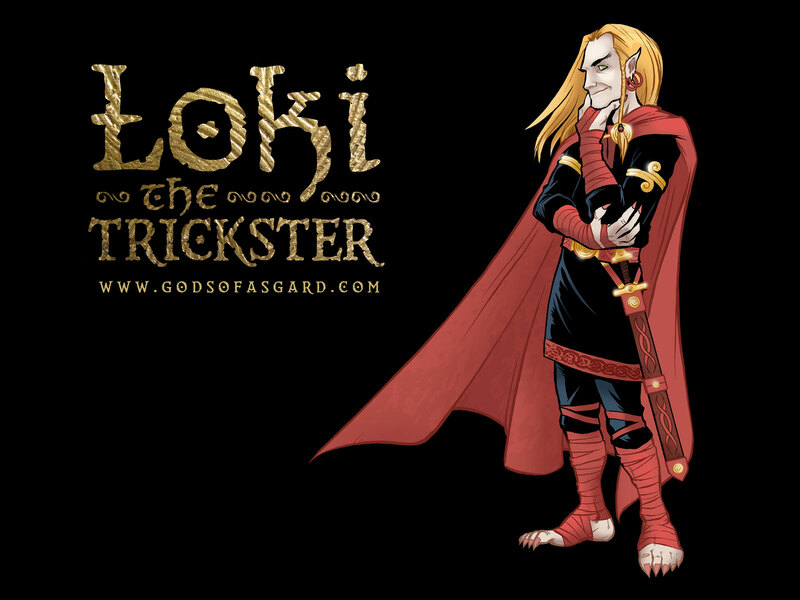 Loki always seemed to be testing everyone, and testing their patience.” This also sounds like a description of Odin as he is portrayed in the Edda. Did you play up similarities in their characters to emphasize a logical reason for their blood-brotherhood? EE - Of course! Odin and Loki are soulmates in many ways. Odin brings him into the fold of the gods, and they are the only ones who can keep up with each other, mentally. They’re both cunning, clever and have questionable personality traits. They also show no fear of what would culturally be considered “feminine things,” such as magic-use and gender-switching. 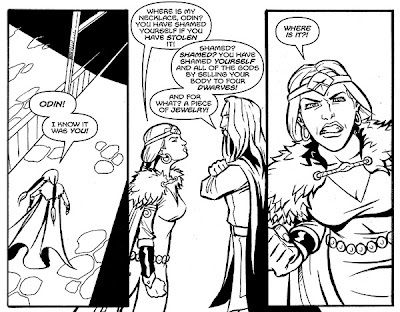 They’re like the Jay and Silent Bob of Norse myth. KS - In “The Marriage of Skadi,” you make the story of Loki and the goat very clear, without the use of pictures. That’s a difficult tale to tell in a family-oriented book! EE - That was exactly why I chose to present it using only Skadi’s expressions! There are a few areas that had to be treated with sensitivity in that way. 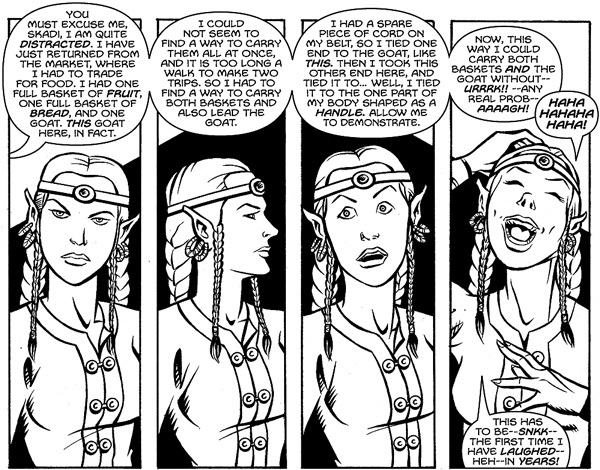 You might have also noticed that Gjalp and Greip, Geirrod’s daughters, have a slightly smaller role than they should. 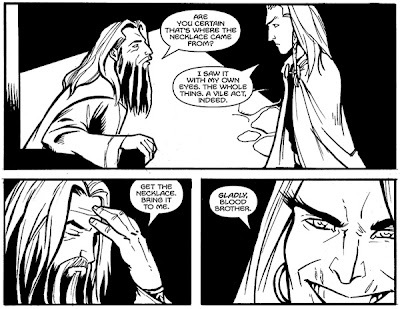 KS - At the beginning of Gods of Asgard, Loki is young and beautiful. As the book progresses, his visage becomes increasingly scarred and corrupted – like the painting in The Picture of Dorian Gray. Does Loki’s visage reflect his own sins, or does it – like the canvas in Oscar Wilde’s novel – hold a mirror to the gods that shows them their own failings? EE - It was mainly a convenient way of visually tracking this handsome, charming guy’s descent, and his descent pulls the Æsir down with him. 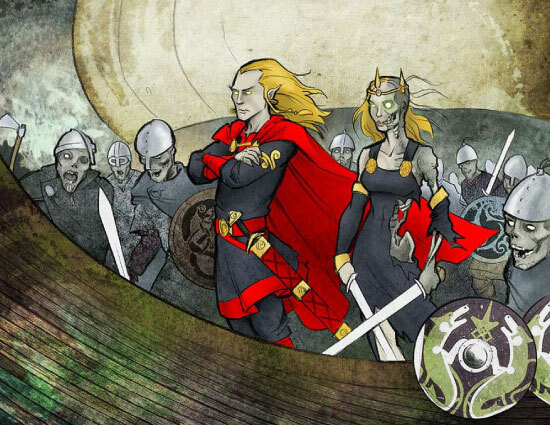 Loki has, by far, the most interesting character arc in the Norse pantheon. 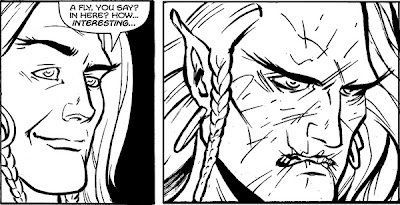 I love that he essentially just tries to keep himself entertained, but this requires more and more malevolence on his part, until eventually his jötun nature takes over, and he becomes an uncontrollable force of evil. But he does it through social manipulation and trickery, of course. KS - You write that “the gods cannot deal with Loki without stooping to his own level.” What does this say about Norse conceptions of godhood? EE - I think it’s really more of a statement on humanity and a cautionary tale about dealing with enemies. But it also serves as an indicator that the Norse gods are much more human and fallible than other gods in other cultures. KS - You decided on “downplaying Freyja’s involvement with witchcraft and glossing over her role as Queen of the Valkyries,” instead portraying her as “the goddess of love, but . . . shallow and cunning.” There is ongoing argument over the role of women in Norse myth – some argue that the mythology is essentially patriarchal and misogynistic, others insist that it contains strong and complex female characters. 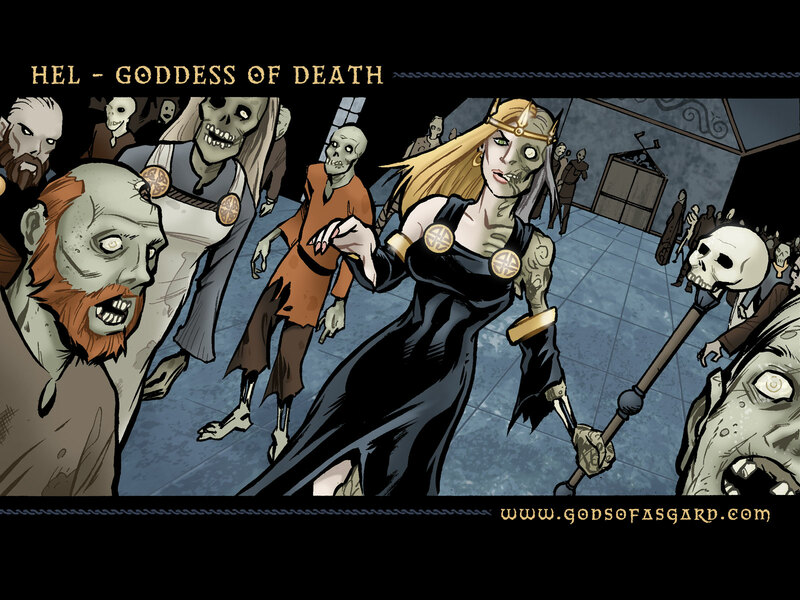 How do you see the role of female goddesses in the myths? EE - Well, for one, I am not truly happy with my depiction of Freyja after the fact. I wish I had worked in more of the shamanistic Freyja and the Valkyrie-Freyja. 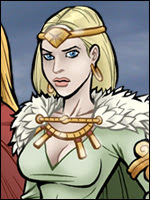 That said, I love Freyja, Idunn, Skadi, and Hel as characters, and I wish there was more for them to do. I did leave out the story of Freyja and Hyndla because it mainly just lists genealogies, and I sometimes regret that decision, but I’m not sure it would make for interesting comics. 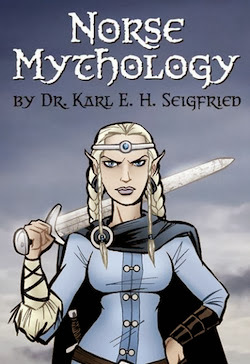 To address the question, I might make a guess that the mythological stories tend to be patriarchal, but the prevailing wisdom I’m familiar with indicates that female deities were quite revered. 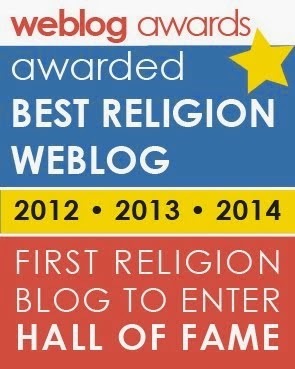 I don’t think the stories – which are largely heroic in nature – truly represent the practical nature of the religion. Click here for Part Four of the interview. Personally I always felt Loki's 'fall from grace' began with the mouth stitching incident -I can't see it as anything but cruel. I can highly recommend this novel to anyone who hasn't read it. I dont' think Loki ever existed in a "state of grace," a concept which would no doubt have been alien to the culture from which he springs. I've addressed this postmodern reading of Loki-as-victim several times on this website (including here) and discussed the fact that such a reading goes directly against the cultural context of the source material.